Aamon. Cyanotype toning: 5’ tannic acid 1%, 15” paper revelator 1+9, acetic acid 0.1%, 5’ tannic acid 0.1%. Dark points are negative holes and do not depend from toning. Canson “C” grain paper, 224g, 24x32cm. Image size 17x25cm. All of the cyanotype toning formulas that I tried, completely bleaching the image in an alkali and re-developing it in a tanning agent for a long time, gave red-browned flat hues with a little dmax. I always obtained best results with long tanning bathes and a quick immersion in a diluted alkali, which gave a print with warm grey, brown or pink lights, while shadows are intense blue, slightly violet or black. A part of the original blue of the cyanotype is conserved in the final print, giving not only a cold hue to shadows, but also keeping relatively high the dmax, penalized by a complete alkaline whitening. I think this is cyanotype toning big deal. The contrast drop in the middle tones can be corrected applying the right curve, the flattening of the high lights often creates a delicate effect of softness and lightness; but the loss of shadow density is a problem that still doesn’t have a solution. Certain images work even without blacks, all played on pastel colors, but others need the strength of intense and deep shadows. Toning formulas that promise deep blacks, neutral lights and no paper dyeing (such as tea or concentrated tannic acid) are found in literature. In general they are variants of the procedure described at the beginning: alkali and tanning. The order of baths, the repetition or not of the successive immersions, ph control, intermediate washings and the tanning or/and alkali nature are the changeable elements. Those variations have a strong impact on final return, but they always have the same denominator: flatness of hues and dmax reduction. But I’m still searching for the magical combination that intensify a cyanotype rather than reducing it, turning the print into a palladium image infinitely less expensive. Moloch. Dualtone cyanotype: 30″ bleach 1%, acetic acid 0.1%, 5′ tannic acid1%, 5′ acetic acid 0.1%. Fabriano Paper 50, 25x35cm; image dimension: 18x27cm. Yesterday night I made some attempts with some formulas. As usual, I didn’t follow a scientific method but a creative one, letting creativity and fate play their role. I tried in the past to formalize with strictness dark room tests, but I always failed. The thing is that some of the variables are hard to control, as temperature and environment humidity. Paper characteristics change from one stock to another and little variations are amplified. Moreover, because of the never-ending number of dissimilarities, it is required an infinite patience. It would be necessary to made them change one of a time, so I’d need thousands and thousands of tests and dark room days. Obviously, only printing Stouffer palettes to have the maximum rigor and the best ease of interpretation. This way, no image will be printed and life will be spent in taking boring tests. I’m sorry, but I’m a photographer and I’m not a lab technician. Life’s too short and all of the pictures I don’t take are images lost forever. In certain cases I rather let variables evolve and print in an intuitive, not rigorous manner. Serendipity is a gift useful as much as meticulousness, while studying alternative techniques. By the way, a similar approach is found in many other areas. A sailboat can be managed because it gives back equilibrium; controlling every detail in a so difficult system or writing motion equations would be impossible. Aamon. Cyanotype toning: 5′ tannic acid 1%, 5′ ammonia 1%, 5′ acetic acid 0,1%. Dark points are inside the negative and do not depend from toning. Rives BFK Paper, 28x38cm. Image dimension 18x26cm. I therefore used a digital negative with color and curve adapted to carbon print. Cyanotype requires a lower difference of density, which means that images printed with those negatives will have completely posterized and white light, a strong contrast and a marked grain. In this case, those defects are not frustrating. I can see how toning behave with completely white lights in zones that didn’t receive any exposition. Too high contrast compensates the toning flatness. Image grain can be amplified or reduced during the process, and this is interesting information too. I used daemon pictures, the Mascarons du Pont Neuf of Paris, because their negatives have many transparent parts, so I do have large zones in prints where blue is the deepest I can obtain on cyanotypes. Negatives are exposed for 12 minutes, the reference exposition timing, that in my case gave the deepest blue I can achieve. A higher exposition blends shadows without augmenting dmax. It is recycle paper, and those are the variables that I deliberately choose not to control. It is the back of some not successful gum prints, VDB or cyanotypes. It is a paper that already went under chemical and mechanical treatments. Some sheets are sized to gelatine and some no. Brands are from Arche Platine, Fabriano Artistico, Fabriano 50, Rives BFK, Canson “C” grain. Some cyanotypes, before toning, have been left for some days oxidizing, to obtain a definitive color, some other only a few hours. Tannic acid is an old 1994 package. In every case, due to past experiences, I still haven’t seen big differences between tannic acid concentration and solution (except for the paper hue due to tea). So I’d say that the active ingredient is still quite functioning. Moloch. Complete cyanotype toning: 5′ ammonia 1%, 1′ acetic acid 0.1%, 5′ tannic acid 1%, 5′ acetic acid 0.1%. Bubble stains were present on paper even before printing the cyanotype and they do not depend from toning. Fabriano Paper Rives BFK, 28x38cm; image dimension: 17x26cm. Kai Hamann published a toning procedure whom results, if not modified during scanning, are extremely astonishing. The reported examples have a pink hue that I easily recognize, some other are perfectly neutral, but most of all shadows have an intense and deep black, as far as in video some prints seem palladium ones or perfect Van Dyke Browns. Resuming the procedure described on his site, Kai Hammann toning is the following: acetic acid 1%, water washing, ammonia 0,5% between 1 and 16 minutes depending on the required hue, water washing, acetic acid 1%, water washing, tannic acid 1% for some minutes, acetic acid washing 1%. At that time he suggests a method to control the final hue of the print, adding one more softly alkali bath after the last washing, but I didn’t explore this way because the last acid bath in Kai Hamann’s table seem having the most cold and neutral hues, whose I’m interested in. Carrying out the procedure to the letter gave wonderful results, often with beautiful hues, but it was still impossible to obtain a black print and contain the dmax loss. Bleaching the image with ammonia gave prints with pink-browned lights and vaguely neutral shadows, something like black-purplish but absolutely not deep. Bleaching only a part of prints for some seconds, I obtain a familiar effect of warm gray high lights and purplish blue shadows, but even in this case I lose dmax. Therefore the proposed toning technique doesn’t work for me. I do not know if it is due to the ammonia or tannic acid quality, water or –more probably- cyanotype formula and composition (ammoniacal ferric citrate is a bad defined compound and it varies from package to package). Interesting collateral and useful information –long live serendipity!- is that the use of acetic acid bath, even if diluted, for example 0.1%, between alkali and tannic, sensibly preserves the bath itself from contamination. Bathing even only one picture directly from an alkalic bath to tannic acid turns this last into a brown compound and easily gets the paper dirty. In two or three images the tannic solution is practically useless. Even an intermediate water bath easily contaminates the tannic acid and the washing bath becomes toning itself, therefore it must be regularly changed. Acetic acid bath gets less dirty and most of all allowed the usage of tannic acid during the entire session without any visible alteration. Hydrochloric acid is often cited as cyanotype support. It is said to augment blue dmax, giving a darker and deeper hue to shadows, almost black, but also providing neutral middle tones, such as metallic grey. I found indications on its use as first developing bath (I use very diluted acetic acid or water) or toning-support. I tried this last procedure, immersing a washed and dried cyanotype in a hydrochloric acid 2% solution for 20’, but the color hasn’t changed at all and the dmax absolutely hasn’t augmented. I don’t want to try higher concentrations, because hydrochloric acid, more than dangerous, gets paper fibers fragile. I still have to verify if hydrochloric acid as development bath achieve the described results. I wouldn’t be willing to use concentrated acid anyway, since some sources cite the possibility of expansion for cyanide gases when a not perfectly washed cyanotype is bathed in an acid. 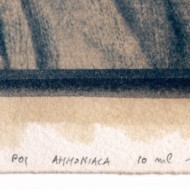 Some sources cites ammonia and tannic acid toning as “red brown”, while giving a toning formula of “grey black” that uses a paper developer as alkali bath instead of ammonia or sodium carbonate. I tried this combination too, using a new diluted developer 1+9. I was expecting a hue slightly different from the ammonia one, not to hope in dmax miracles. I actually obtained wonderful purplish hues, most of all in the tannic acid combinations, some seconds inside the developer and then tannic acid again, but it is absolutely impossible to obtain black cyanotypes without dmax loss during toning. All of the described cyanotype toning techniques makes splendid results, particular and unique images, delicate hues, optimal gum prints backgrounds, etc… No one that I tried, at least in my case, is able to produce a black toning, intensification or at least a limited dmax loss, which happens every time I tone a cyanotype. 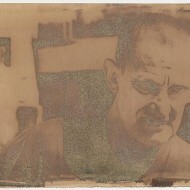 A hydrochloric acid bath particularly seems not to influence a washed and dried cyanotype. Collateral information, a useful forethought consists in using acetic acid baths between alkali and tannic acid to preserve this last solution, sensibly augmenting its life. Vai Fabusdr.. esaustivo e sperimentale come sempre..
molto utili tutti i tuoi consigli. P.s. non è che hai un feed Rss così mi arrivano tutti i nuovi articoli in mail?? grazie per la visita e l’apprezzamento. Il feed è nella colonna di destra sotto la voce “Meta”. Hint: Change the tannic acid to gallic acid. You’ll get an image formed by “iron gall ink”. (See: http://en.wikipedia.org/wiki/Iron_gall_ink for more info about the ink…) Unfortunately it eates the paper in the long term. BTW, I don’t believe you can get the delicacy of Pt/Pd by toning Cyanotypes to black (even if you manage to do it successfully); simply because the tonal progression is not that soft -> especially in the highlights. You can’t beat a Pt/Pd print’s highlights with any other process… Full stop. 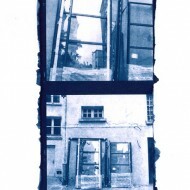 As a last note: As you’re so into Cyanotype, I think you should definitely buy Mike Ware’s book “Cyanotype”. thank you very much for reading and commenting. In the past I read a lot of your posts on the Alt-photo-process mailing list and I know you are a great expert. I hope you will came back to Camera Obscura, I’m translating all the posts in English, but it takes a lot of time! Thank you for the hint on the acid too. It is a shame that gallic acid is much more difficult to find than tannic acid. It is sure that you can not make Pt/Pd prints with cyanotype, each technique has its own characteristics and beauty. But I’m not especially interested in the precise characteristics of the print, I print in Pd because it is black and relatively easy, in other cases I prefer carbon prints. If i can turn a cyanotype in a more neutral print with reasonable hight dmax it would be an interesting and cheap alternative to Pt/Pd. Not the same, but a technique that can satisfy my needs. I don’t own the nice Mike Ware book, but I read it some years ago. I use the classical Cyanotype. Ware’s cyanotype is a little bit more complex and toxic, and one thing i love about classical cyanotype is its semplicity and lack of toxicity. But maybe to obtain black cyanotype it is the only possible way. Thank you again for reading and your suggestions. ho letto con grande interesse i tuoi lavori sperimentali e nei limiti del possibile cerco di seguire la stessa strada. ho ripreso da alcuni giorni a stampare cianotipi con grande soddisfazione. su un vecchio testo veniva segnalato l’acido gallico (che non ho mai trovato da nessuna parte) per ottenere delle stampe virate in un bruno molto scuro, quasi nero. mi chiedevo se i tannini del vino possono pigmentare un cianotipo… farò qualche prova. Ciao Giorgio e grazie mille del commento. I tanini del vino funzionano di sicuro, levando saturazione al blu e quindi portando il ciano delle ombre più verso il nero. Il “problema” è che il vino macchierà la carta, quindi avrai il viraggio delle ombre e la tintura delle luci. Le virgolette le ho messe apposta perché l’effetto pu`o essere molto bello, trasformando un problema in un vantaggio. L’acido gallico cercando bene si trova, ma costa tantissimo. ieri ho fatto delle prove di pigmentazione con del vino rosso su alcuni pezzetti di carta cianotipata. ho notato che l’alcol modifica la permeabilità della carta e l’acqua sembra scivolarci sopra. pensavo di liberarmi dell’alcol con la bollitura e nel contempo concentrare il vino per avere una % maggiore di pigmento. la pegmentazione tuttavia era debole e come hai detto la carta si colora. ieri pensavo tra me e me. la carta si colora passivamente mentre l’immagine si colora chimicamente. se la carta non fosse permeabile, i bianchi resterebbero puliti. in merito pensavo di provare a usare una carta politenata emulsionata, tipo la carta da bianconero. mi chiedevo se la carta glossy per inkjet, può avere una struttura simile. in questo caso la gelatina potrebbe essere lavata dai tannini non fissati. Per eliminare l’alcool dovrebbe essere sufficiente lasciare il vino nella bacinella di viraggio per qualche tempo, la superficie di scambio aria/vino è molto ampia e l’alcool dovrebbe andarsene rapidamente. Scaldarlo in una pentola come suggerisci potrebbe essere un’altra buona soluzione. Per quanto riguarda la “protezione” della carta dai tannini la mia esperienza con il the è che la gelatina si colora più delle fibre della carta stessa, vedi per esempio l’ultima foto dell’articolo L’ammoniaca nei viraggi cianotipo che risponde esattamente alla tua domanda. La carta bianco e nero tradizionale contiene pure lei abbondante gelatina. Per la inkjet non so di preciso come preparino il fondo, ma ti posso dire che con il the la carta matte della Epson era in assoluto la carta che si colorava di più. Infine tieni presente che la carta non è costituita solo da fibre di cellulosa, ma è sempre presente un collaggio: gelatina, colla di pesce, colla chimica, e via dicendo. col vino sono ancora alla fase molto sperimentale, conto di fare una prova la settimana prossima (quando avrò un po di tregua dal lavoro). in compenso ho provato lo schema di viraggio al thè con successivo bagno in ammoniaca. da quello che riesco a intuire da un file jpg mi sembra che la stampa sia buona, le ombre sono diventate praticamente nere e le luci non sembrano essersi “sporcate” troppo, bravo! Beato te che hai trovato l’acido tannico a prezzi ragionevoli, io l’ho preso in farmacia pagandolo un occhio della testa. Se riesci a trovare l’acido gallico secondo la letteratura sul cianotipo dovrebbe dare neri ancora più profondi e luci più pulite, prova. Per quanto riguarda la durata del bagno direi che è molto breve, vedrai che rapidamente cambia colore e effetto sulle stampe. La durata di vita è allungata tantissimo se fai dei bagni di lavaggio di semplice acqua del rubinetto fra il bagno di acido e quello di ammoniaca o simili. In questo modo eviti di contaminare i bagni fra di loro e l’acqua del rubinetto la puoi cambiare al limite per ogni stampa. Tutto ci`o vale per un applicazione “rigida” dei bagni, ovvero se vuoi cercare di ottenere risultati riproducibili. Se accetti di giocare un po’ con il caso, di avere risultati imprevisti, allora il bagno di viraggio lo puoi usare anche quando ha completamente cambiato colore. I risultati migliori con il cianotipo li ho avuti sperimentando a piede libero, quindi il mio consiglio è di lasciarsi andare senza troppo badare al rigore o alla durata di vita dei bagni. With regards to using the HCL for first development. It works well on both the classic and Ware cyanotypes. I get it from Home Depot as swimming pool acid at 14.5% and dilute it to 1% stock solution and then further dilute that to a 0.25% working solution. With my classic cyanotypes it also drastically reduced exposure times from over 20 minutes to less than 3 minutes using an Amergraph V28 exposure unit. Also, virtually no pigment is rinsed out in the wash, keeping highlight details intact and giving a better dmax. thank you very much for your comment. Less than 3 minutes is really a good improvement! @greg, potassium ferricynide, produce cyanidric acid if exposed to a strong acid.